The bipartisan Freedom of Information Act Implementation Act (H.R. 1211), co-sponsored by Representatives Darrell Issa (R), Elijah Cummings (D), and Mike Quigley (D) unanimously passed the House tonight with a staggering 410 votes. 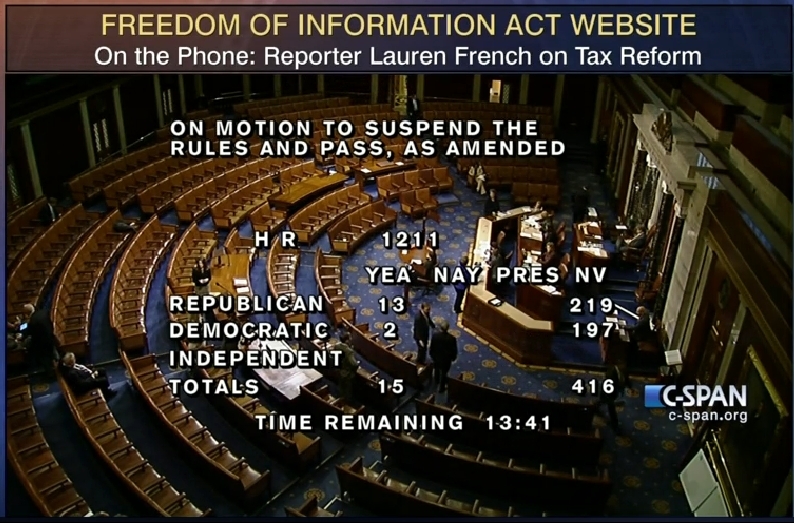 It is now up to the Senate to enact Freedom of Information Act reform. Requiring each agency to update its FOIA regulations “not later than 180 days after the enactment of this Act.” As the National Security Archive has previously reported, a majority of the 101 federal agencies have not updated their FOIA regulations to incorporate Attorney General Eric Holder’s declaration of a “presumption of disclosure,” encouragement of discretionary releases, and order to remove “unnecessary bureaucratic hurdles.” The Federal Trade Commission has not updated its regulations since 1975. While the idea of common, government-wide FOIA regulations –proposed in the White House’s Open Government Partnership National Action Plan— may also be a good idea, the National Security Archive believes a statutory requirement trumps a non-binding White House instruction. In either case, the devil will be in the details, and open government watchdogs must be vigilant to ensure that the regulations are progressive rather than regressive. And lastly, the advancement of the online, one-stop FOIA portal for requesters. Sadly, the language in this legislation that requires this portal does not take the final, logical step and require that agencies join the 21st century and post released documents online. The National Security Archive lauds the House for taking this good first step to begin the process of much needed FOIA upgrades. Reform to the “withhold it because you want to withhold it” b(5) FOIA exemption. The b(5) exemption is used to withhold predecisional information and “inter-agency or intra-agency” communication. Think about that. That’s a lot of information that is exempt from the Freedom of Information Act requests, if an agency wants it to be. Even Attorney General Holder recognized the potential for b(5) misuse when he wrote his memorandum on FOIA, instructing that agencies “should not withhold information simply because it may do so legally.” The problem is… they still do. Two relevantly simple tweaks to the b(5) exemption language would substantially improve this problem. First, model the b(5) exemption on the “p(5)” exemption of the Presidential Records Act which limits the withholding the highest levels of deliberations to 12 years. The second tweak is to treat the b(5) exemption like other exemptions including b(2) “internal practice” and b(6) “personal privacy” exemptions and build in a harm test to determine, case by case, if the government’s claims of predecisional or confidential secrecy outweigh the requester’s claims of value to the public’s interest. As other open government groups have argued, a public interest test is also needed for b(3) statutory exemptions. Statutory exemptions are backdoor exemptions that are often secretly snuck into other laws. There are at least 170 statutory exemptions which include the prohibition of release on such things as: cigarette additive information, “obscene matter,” or even information on watermelon growers. While some b(3) exemptions are proper, the statutory exemption was not written into the FOIA so that Congress could provide blanket denials about the special interests of their constituencies. Adding a harm test to b(3) will fix this. Finally, the Senate must advance the Freedom of Information Act into the internet era by truly ensuring that a “release to one is a release to all.” It must do this by requiring that agencies post (at some point, not necessarily in realtime) non-first person FOIA releases onto their FOIA reading rooms, or FOIAOnline. As we have explained in this post, posting documents as they’re released underscores that these documents belong to the public; enriches debates on important policy issues; eliminates processing of duplicate FOIA requests; and –perhaps most importantly in this era of austerity– saves money. I am hopeful that representatives and senators will follow up on the excellent first step by Reps Issa, Cummings, and Quigley and create a law that fundamentally shifts the Freedom of Information Act toward greater openness. I’m also wary. Remember: the Senate Judiciary Committee has passed the Faster FOIA Act three times since 2005 without it becoming law. In 2010 the Faster FOIA bill passed the entire Senate by unanimous consent, only to die in the House. A year later, the 2011 Faster FOIA bill again passed out of the Senate by unanimous consent; but this time –in an act that still stings to sunshiners like me– Speaker Boehner gutted it and replaced it with the last-minute, secretly-drafted “Budget Control Act of 2011” to ensure quicker passage in the Senate. But if you look on the sunshiny side… now that now that the House has finally passed a FOIA Bill, the Senate has its elusive shot to improve the law. I hope the Senate passes this improvement. If it helps we have posted a redlined copy of FOIA showing the changes made by the new bill at http://www.nationalsecuritylaw.org/files/pubs/FOIA_(redlined_HR_1211).pdf.